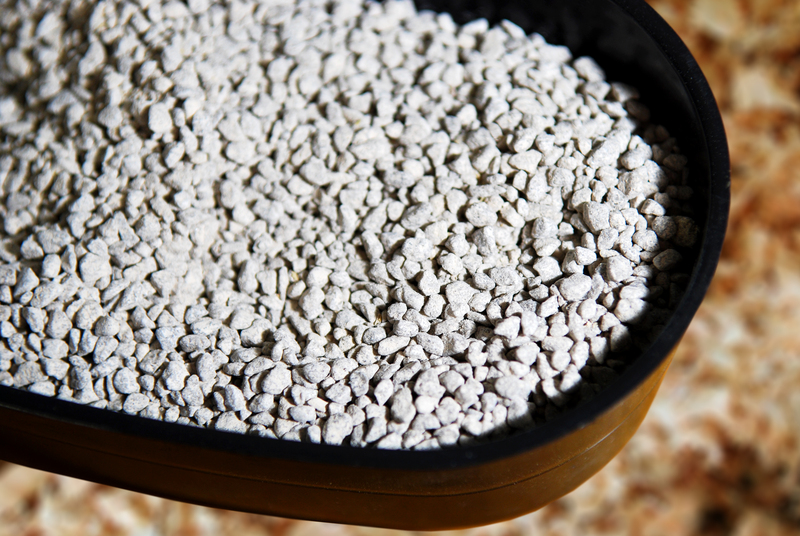 Premium calcium carbonate (limestone) grit for poultry PLUS Vita-Hen Prebiotics and essential minerals. Recommended for chickens age 8 weeks and older. Essential for digestion and general well-being. Added minerals like calcium, which promotes stronger bones and egg shells; copper for helping to prevent anemia; zinc for bone growth and feathering. Feeding instructions: Place in a shallow dish or scatter on the ground for your chickens (8 weeks and older) to free feed. One bag should last 6 chickens about a month. Save money with this 4-in-1 supplement. It is a grit, calcium source, prebiotic, and mineral boost. 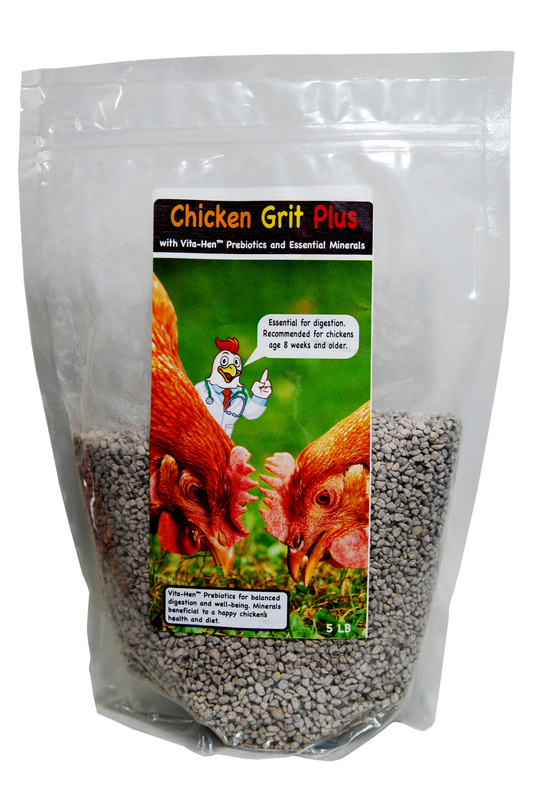 Chickens need grit to aid in grinding food in their gizzard. We’ve chosen insoluble limestone (calcium carbonate), which not only helps to aid in digestion, but also provides a much needed source of calcium. Calcium improves egg shell strength. In addition, we’ve added Vita-Hen Prebiotics and valuable minerals which are important to the health and well-being of your chickens. Calcium Carbonate (limestone), Zinc Amino Acid Chelate, Copper Amino Acid Chelate, Manganese Amino Acid Chelate, Potassium Amino Acid Complex, Magnesium Amino Acid Chelate, Potassium Sorbate, Water, Corn Oil, Glycerin, Onion Extract, Orange Peel Extract, Guar Gum, Soybean Oil, and Vegetable Oil. Place in a shallow dish or scatter on the ground for your chickens (8 weeks and older) to free feed. 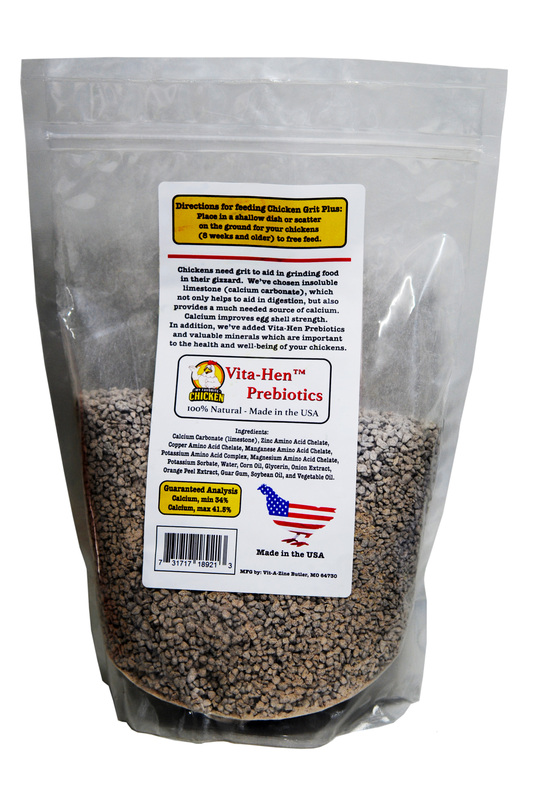 Vita-Hen Prebiotics for balanced digestion and well-being. Minerals beneficial to a happy chicken’s health and diet.